You can access Hilton Al Ain’s web page here and Abu Dhabi’s here. You won’t warn points for stays beyond December 31, 2018. Your elite benefits won’t be extended either and you won’t earn elite qualifying stays or nights. Radisson Rewards members should be eligible to earn points and enjoy their elite benefits effective January 1, 2019. “Actually, the construction of the hotel began in 1968 and it finished in March 1971, when it was inaugurated by His Highness Shaikh Khalifa bin Zayed, now the President of UAE,” explained Adham El Sebaey, general manager of Hilton Al Ain. “Originally it was build to host a royal wedding and ever since it has became a favourite with the local community. We even have one Emirati person who comes here every day since the hotel opened. He often sits at that table over there,” added El Sebaey, pointing towards one of the tables in the atrium’s cafe. 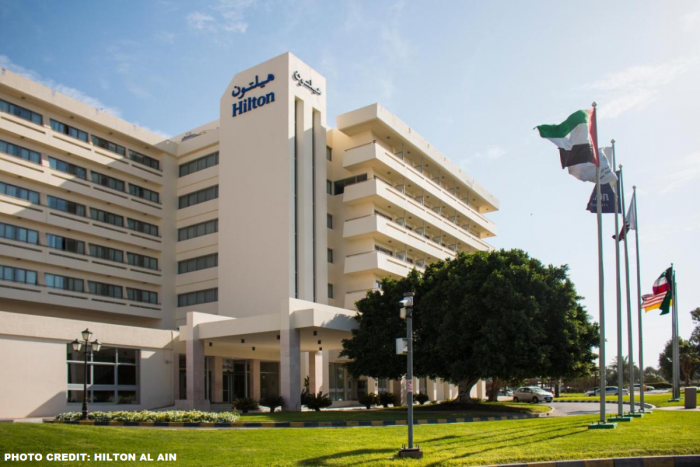 Older than UAE itself, Hilton Al Ain was one of the very few concrete buildings in the city in those days. In fact, the only other one known to exist was the Oasis hospital, built some 50 years ago. Well. I actually stayed once at this Hilton Al Ain property once while transiting in Dubai. I felt bad for the driver that Emirates had arranged to take me to the hotel who basically waited the entire 8 hours sleeping inside the car on the parking lot. Both of these hotels must be owned by the same company/individual as they are overseen by one General Manager who was fairly recently appointed (did few Google searches on the topic). I guess that the owner was not willing to put up the required cash to keep these two hotels up to the Hilton standards and hence the brand switch to Radisson that seems to be more flexible. Sad to see these hotels exit Hilton system regardless. Next articleUpdate On The Massive Cathay Pacific Data Breach Affecting 9.4 Million Passengers – Customers Finally Notified!